A number of Atlanta families now have the tools and knowledge of how to make sure their children do not fall victim to the number one killer and cause of hospitalization for young people. 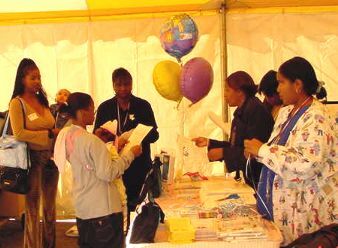 During a special baby shower sponsored by the Allstate Foundation, the Injury Free Coalition for Kidssm, and the hospital, representatives from 60 families gathered at Hughes Spalding Hospital of Grady Health System to learn about home safety and how to make sure their children are properly transported in motor vehicles. “It is numbers like that which forced the Allstate Foundation to get involved,” explained Allstate Foundation Executive Director Jan Epstein. “Knowing this problem exists, we could not sit back and allow children to stay in harms way,” she continued. The Allstate Foundation provided funding for the Safe at Home and on the Road with Allstate home safety bags given to each family attending the shower. The bags included smoke detectors, cabinet latches, water-thermometers, tubes to make sure the children’s toys are the appropriate size, and much more. Each parent attending the shower also got instructions on how to use the items in the bag and additional information about how to make their home safe. “Everyone is morally responsible for doing what they can to play a role in making a difference in the number of children who die needlessly,” Dr. Barbara Barlow, the founder and director of the Injury Free Coalition for Kids, the country’s fastest growing injury prevention organization. “Proper use of the items included in the safe at home bags can help with that reduction and it can help to substantially reduce the number of home injuries to children,” Barlow continued. The 60 families who received the Safe at Home and on the Road with Allstate bags were the first of 500 families to receive the bags in Atlanta. In addition to those being distributed, a total of nearly 10,000 will be given to families in other cities including: New York, Kansas City, San Diego, Worcester, Miami, St. Louis, Los Angeles, Pittsburgh, Philadelphia, Cincinnati, and Chicago. In addition to receiving the Safe at Home and on the Road with Allstate bags each shower participant received a car seat and instructions on how to properly install it. The car seats were made possible Ford, Chrysler and the Governor’s Department of Highway Safety.